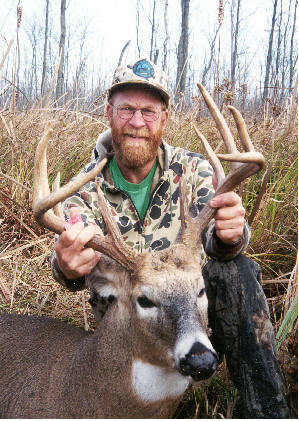 President Tim Kaul displays a buck taken in the Ulao Swamp during the 2001 hunting season. introduce the first newsletter of The Ulao Creek Partnership, Inc. (UCP). So much has taken place since December 1995, when David Schwengel had the idea to bring people together to increase awareness of a little creek and watershed in southeast Ozaukee County. You will notice in this and future newsletters that much has been accomplished, yet so much remains to be done. The results from one study may answer some questions, but also reveal many more. As the creek continues to flow, so do we need to continue to push on if we are to achieve our goals. The Partnership has summarized its goals to form its mission statement, which is to form an alliance of concerned citizens, landowners, and public and private organizations to protect and improve the water quality and natural habitats in the Ulao Creek watershed. We continue to follow this mission through the newsletter by informing the public of our activities and giving you information about Ulao Creek and the watershed. So, as you read through this and future editions of the Ulao Whistler or visit our new website (ulaocreek.org), please have an open mind about what we are trying to accomplish and see where you may want to get involved with us. The Partnership’s mission is about protecting and enhancing the watershed, but the real meaning of Partnership is people working together for a common good. Please consider joining us with an active membership. We can make a difference in how we live in our environment, even in a little watershed in eastern Wisconsin. Do you have feedback on our UCP newsletter? The Ulao Creek Partnership, Inc. (UCP) is a grassroots, community-based 501 (c)(3) nonprofit organization comprised of concerned citizens, landowners, and public and private organizations aligned to protect and improve the water quality and natural habitats in the Ulao Creek Watershed.